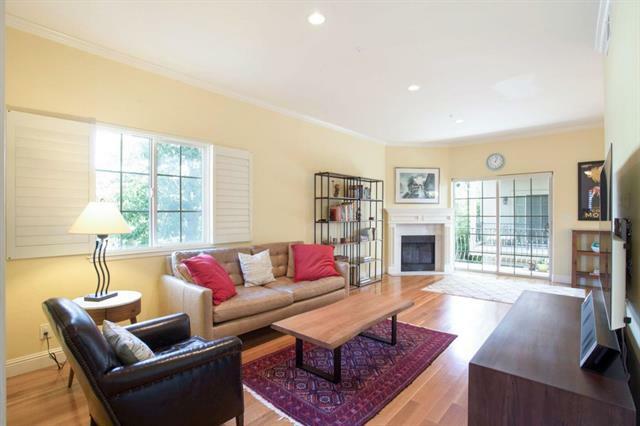 An elegant and modern Mediterranean style home located in the heart of downtown Sunnyvale. This two-story, end-unit home features 2 bedrooms and 2.5 bathrooms in 1,343 square feet of living space. Meticulously maintained with an open and inviting floor plan that boasts high ceilings and plenty of natural light. Enjoy the designer kitchen that features granite countertops, custom cabinetry, stainless steel appliances. Other fabulous features of this home include hardwood floors, plantation shutters, recessed lighting, interior laundry, central AC and much more. This impeccable home is located in vibrant downtown Sunnyvale, where you’re just a short walk to Historic Murphy Ave, Sunnyvale Town Center, and other wonderful amenities. With a CalTrain station a few blocks away, commute up and down the Peninsula with ease. And just minutes away from major freeways. Please check out the virtual tour link for a 3D look inside the home and a floor plan rendering. Minimal HOA dues of $276/month.